DIAZ-MONTERROSAS, P. R. , POSADA-GOMEZ, R. , MARTINEZ-SIBAJA, A. , AGUILAR-LASSERRE, A. A. , JUAREZ-MARTINEZ, U. , TRUJILLO-CABALLERO, J. C.
Kinect sensors are Human Computer Interaction devices oriented to entertainment, but have rapidly spread to several fields such as health care, physical therapy, and training. Their multiple advantages place them at present in a competitive situation compared to traditional solutions. On the other hand, their accuracy and precision for sensitive human applications are still under critical examination. This paper presents a brief literature review on the validity and reliability of the first and the second generation Kinect sensors to get an idea of the feasibility of their propagation as measuring devices in functional assessment applications. Results are difficult to compare because they depend largely on the type of measured elements, the angle of view of the measurement, the distance to the sensor, and even the diversity of human motion features. Nonetheless, they suggest that Kinect sensors are capable of properly identifying posture and motion, but not body or joint rotations, unusual postures, or occlusions. D. Regazzoni, G. De Vecchi, and C. Rizzi, "RGB cams vs RGB-D sensors? : Low cost motion capture technologies performances and limitations," Journal of Manufacturing Systems, vol. 33, no. 4, pp. 719728, 2014. B. Bonnechère et al., "Validity and reliability of the Kinect within functional assessment activities: Comparison with standard stereophotogrammetry," Gait and Posture, vol. 39, no. 1, pp. 593598, 2014. P. Plantard et al., "Pose Estimation with a Kinect for Ergonomic Studies: Evaluation of the Accuracy Using a Virtual Mannequin," Sensors, vol. 15, no. 1, pp. 17851803, Jan. 2015. O. Geman and H. Costin, "Automatic Assessing of Tremor Severity Using Nonlinear Dynamics, Artificial Neural Networks and Neuro-Fuzzy Classifier," Advances in Electrical and Computer Engineering, vol. 14, no. 1, pp. 133138, Feb. 2014. B. Müller et al., "Validation of enhanced kinect sensor based motion capturing for gait assessment," PLOS ONE, vol. 12, no. 4, p. e0175813, Apr. 2017. G. Blumrosen et al., "A Real-Time Kinect Signature-Based Patient Home Monitoring System," Sensors, vol. 16, no. 11, p. 1965, Nov. 2016. Z. Ren et al., "Robust part-based hand gesture recognition using kinect sensor," IEEE Transactions on Multimedia, vol. 15, no. 5, pp. 11101120, 2013. R. a Clark et al., "Validity of the Microsoft Kinect for assessment of postural control.," Gait & posture, vol. 36, no. 3, pp. 3727, Jul. 2012. S. Obdrzalek et al., "Accuracy and robustness of Kinect pose estimation in the context of coaching of elderly population," in 2012 Annual International Conference of the IEEE Engineering in Medicine and Biology Society, 2012, pp. 11881193. L. Chen, H. Wei, and J. Ferryman, "A survey of human motion analysis using depth imagery," Pattern Recognition Letters, vol. 34, no. 15, pp. 19952006, 2013. R. Lun and W. Zhao, "A Survey of Applications and Human Motion Recognition with Microsoft Kinect," International Journal of Pattern Recognition and Artificial Intelligence, vol. 29, no. 5, p. 1555008, Aug. 2015. T. Mallick, P. P. Das, and A. K. Majumdar, "Characterizations of Noise in Kinect Depth Images: A Review," IEEE Sensors Journal, vol. 14, no. 6, pp. 17311740, Jun. 2014. P. K. Pisharady and M. Saerbeck, "Recent methods and databases in vision-based hand gesture recognition: A review," Computer Vision and Image Understanding, vol. 141, pp. 152165, Dec. 2015. T. D'Orazio et al., "Recent trends in gesture recognition: how depth data has improved classical approaches," Image and Vision Computing, vol. 52, pp. 5672, Aug. 2016. D. Webster and O. Celik, "Systematic review of Kinect applications in elderly care and stroke rehabilitation," Journal of neuroengineering and rehabilitation, vol. 11, p. 108, 2014. J. Han et al., "Enhanced computer vision with Microsoft Kinect sensor: A review," IEEE Transactions on Cybernetics, vol. 43, no. 5, pp. 13181334, 2013. T. Breuer, C. Bodensteiner, and M. Arens, "Low-cost commodity depth sensor comparison and accuracy analysis," in Electro-Optical Remote Sensing, Photonic Technologies, and Applications, 2014, vol. 9250, p. 92500G. R. A. Clark et al., "Concurrent validity of the Microsoft Kinect for assessment of spatiotemporal gait variables," Journal of Biomechanics, vol. 46, no. 15, pp. 27222725, 2013. A. Schmitz et al., "Accuracy and repeatability of joint angles measured using a single camera markerless motion capture system," Journal of Biomechanics, vol. 47, no. 2, pp. 587591, 2014. B. Galna et al., "Accuracy of the Microsoft Kinect sensor for measuring movement in people with Parkinson's disease," Gait & posture, vol. 39, no. 4, pp. 10628, Apr. 2014. Y. Yang et al., "Reliability and Validity of Kinect RGB-D Sensor for Assessing Standing Balance," IEEE Sensors Journal, vol. 14, no. 5, pp. 16331638, May 2014. R. A. Clark et al., "Reliability and concurrent validity of the Microsoft Xbox One Kinect for assessment of standing balance and postural control," Gait and Posture, vol. 42, no. 2, pp. 210213, 2015. M. E. Huber et al., "Validity and reliability of Kinect skeleton for measuring shoulder joint angles: A feasibility study," Physiotherapy (United Kingdom), vol. 101, no. 4, 2015. X. Xu and R. W. McGorry, "The validity of the first and second generation Microsoft Kinect for identifying joint center locations during static postures," Applied Ergonomics, vol. 49, pp. 4754, 2015. J. Darby et al., "An evaluation of 3D head pose estimation using the Microsoft Kinect v2," Gait & Posture, vol. 48, pp. 8388, 2016. 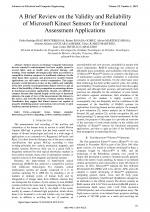 H. Gonzalez-Jorge et al., "Metrological evaluation of Microsoft Kinect and Asus Xtion sensors," Measurement: Journal of the International Measurement Confederation, vol. 46, no. 6, pp. 18001806, 2013. M. Bueno et al., "Metrological evaluation of Kinect Fusion and its comparison with Microsoft Kinect sensor," Measurement: Journal of the International Measurement Confederation, vol. 73, pp. 137145, 2015. H. Gonzalez-Jorge et al., "Metrological comparison between Kinect i and Kinect II sensors," Measurement: Journal of the International Measurement Confederation, vol. 70, pp. 2126, 2015. A. Corti et al., "A metrological characterization of the Kinect V2 time-of-flight camera," Robotics and Autonomous Systems, vol. 75, pp. 584594, Jan. 2016. 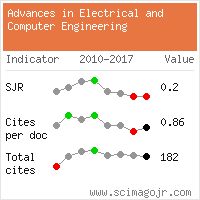 Citations for references updated on 2019-04-19 17:39 in 204 seconds.